Your Unlimited Voicemail Plan is equipped to receive faxes 24/7. Why pay for a separate dedicated fax line or have multiple numbers for your contacts and prospects to remember when Unlimited Voicemail Plan can do it all ? Faxes are recognized automatically, whether the caller presses the send button on their fax machine or their fax machine automatically transmits the fax. The document is saved in the mailbox. Just like a voice message, you will have e-mail or phone notification of the fax. You can view your faxes online, through your e-mail notification or have them forwarded to a fax machine of your choice. 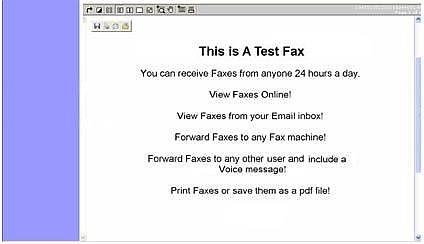 One of the most exciting benefits of Virtual Fax is that you can view the fax in full without wasting paper. If you choose to print certain pages or all of the fax you can do so right from the View Screen. Plus, with one click of a button the Fax can instantly be turned into a PDF file for you to save on your personal computer. How do you get this service ? Virtual Fax. Why pay for a separate dedicated fax line or have multiple numbers for your contacts and prospects to remember when Unlimited Voicemail Plan can do it all.